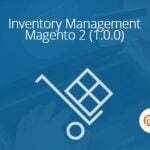 We’ve already explored Barcode Management for Magento 2, and today we’d like to draw your attention to another tool from the Inventory suite – the Magestore Purchase Management Magento 2 extension. Suppliers, quotations, purchase orders, and other aspects are represented in the module. You only have to install and configure it to get all the enhancements. Below, you can find core extension’s features and a complete Magento 2 extension backend tutorial. 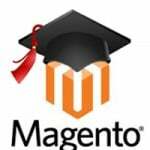 So, let’s start with the core functionality of the Magestore Purchase Management Magento 2 module. First of all, it lets you manage purchase orders with the help of 4 statuses: New, Pending, Process, and Completed. Next, it is necessary to mention that the extension offers 2 ways for creating new orders. 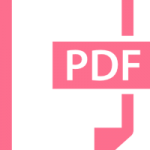 You can convert everything from quotations as well as create them manually. Another great improvement is related to a combined interface that allows to receive, return, and invoice products in a single place. There is also a reliable notification system that allows you to rapidly contact suppliers and inform them about orders and quotation via advanced emails. As for key features, they are divided into several groups: Supplier, Quotation, Purchase Order, and Others. The Supplier features allow you to view all suppliers in a list with the following information illustrated: total SKU, date of the last order, and purchase order value. Besides, you can add new suppliers or edit the existing ones. To make your daily routine more simple, the Magento 2 Purchase Management extension provides the ability to assign products to suppliers via CSV. Alternatively, you can still do everything manually. Besides, you a create, edit, or view price lists for each product from each supplier. To create a price list for multiple products, only import a CSV file with corresponding data. In their turn purchase orders can be viewed as well as filter and sorted according to multiple conditions. All data can be exported via CSV or XML. It is also worth mentioning that a quotation can be easily converted to a purchase order. Products can be added or updated both manually and via CSV. And you can easily transfer received products to the warehouse. 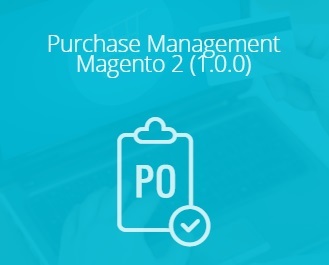 The Magestore Purchase Management Magento 2 extension is 100% open source, can be easily installed and effortlessly configured, as well as has a very convenient interface. See the next section to watch the module in action. All extension’s features are available under the Purchase Management tab. The tab is divided into 3 sections: Purchase Order Management, Quotation Management, and Supplier. Each section consists of several subsections. 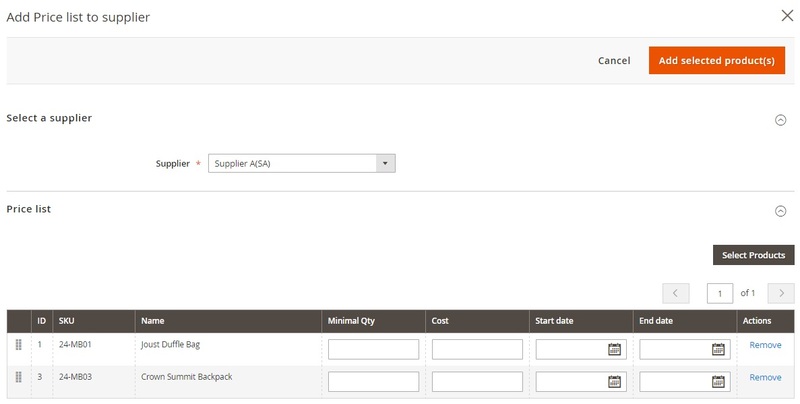 The Manage Purchase Order screen provides lots of opportunities. First of all, you can view all POs in a grid that illustrates PO numbers, date of purchase, supplier, requested, received, and billed quantity, status, expected delivery date, as well as paid total and grand total. Besides, you can view each PO from the Action column that contains the View link. To create a new purchase order, you should complete 4 steps of actions. First of all, fill in general information: Created Time, Supplier, and Comment. Next, you should add products. In the Summary Information section, there are 5 options: Import Products, Supply Need Products, Back Order Products, Low Stock Products, and All Supplier Products. Choose one to fill in the section. Now, you should add Shipping and Payment data. 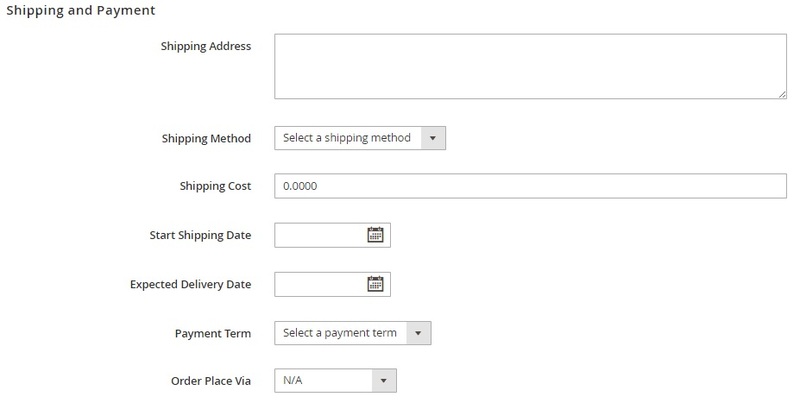 The section contains the following fields: Shipping Address, Shipping Method, Shipping Cost, Start Shipping Date, Expected Delivery Date, Payment Term, and Order Place Via. The General Information section is absolutely similar to the first step. To complete the order, hit the appropriate button. Now, let’s have a look at the Manage Quotation screen. It provides the same options as the Purchase Order screen: you can apply filters, save views, enable/disable columns, or export data. As for the Manage Quotation grid, it shows quotation numbers, date of creation, suppliers, requested quantity, status, and grand total. Besides, you can view each quotation from the Action column. To create a new Quotation, specify general information (Created Time, Supplier, Comment) and hit the Prepare Product List button. You quotation is saved. Now, import products. You also have the same 5 options: Import Products (via CSV), Supply Need Products, Back Order Products, Low Stock Products, and All Supplier Products. Fill in the Shipping and Payment section: Shipping Address, Shipping Method, Shipping Cost, Start Shipping Date, Expected Delivery Date, Payment Term, and Order Place Via. The situation with the General Information section was described above. Next, you can save the quotation or convert it to PO. The Manage Suppliers screen also allows filtering, saving views, and exporting data. As for the grid, it shows supplier codes, total SCU count, purchase order value, date of the last purchase order, and status. You can view each supplier from the Action column. While adding a new supplier, you should specify its core information and address. 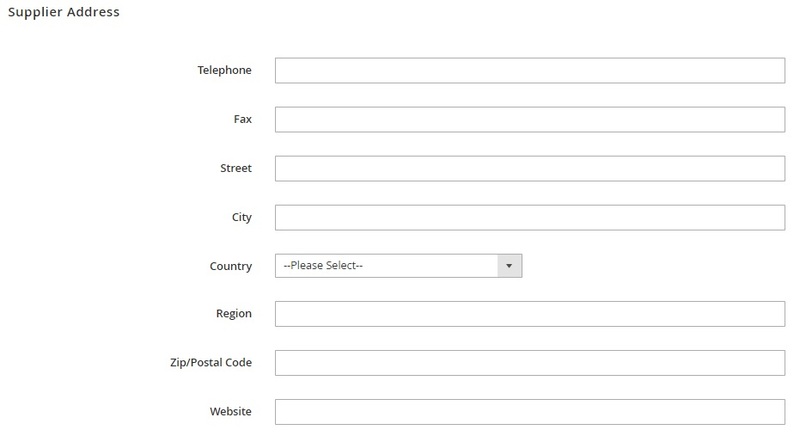 The firs section required to fill in the following fields: Supplier Code, Supplier Name, Contact Person, Email, Description, and Status. Supplier Address includes such information as telephone, fax, street, city, country, region, zip code, and website. specify minimal quantity, cost, and start/end dates. The Magestore Purchase Management Magento 2 extension essentially improves the default routine. After installing this extension, you will forever forget about annoying processes related to the purchase management. The module has a very intuitive backend interface so you or your administrators will easily master it. As for the price of the extension, it is $299 for the Magento 2 module.